A cell phone in Japan is a must, but how do you choose the right plan? Whether you’re planning a short-term or long-term stay in Japan, you’ll want to get your hands on a mobile phone as soon as possible after arriving. Tokyo is a bright and bustling city but it won’t be easy to make friends and stay in touch if you don’t even have a cell phone to call or text. Depending on the length of your stay, there are a number of options for service plans and cell phones in Japan. Regular subscription plans and contracts are available to those staying on a student visa, though certain restrictions apply. Depending on the length of stay, most foreigners in Japan will be required to pay the entire cost of the phone up front, which can be quite expensive if you are planning to get a new smart phone. This is at the discretion of your service provider. To subscribe to a phone plan you will need a Japanese ID (Zairyū card), passport, and a Japanese bank account (bring your bank book). Though it might be more expensive up front, almost all Japanese people and long-term foreign residents take this route as it offers the most features and is less expensive in the long run. It’s entirely possible for long-term students to simply get a SIM card using a service such as Mobal. They even give you the possibility of getting the SIM card at the airport or at your Japanese address. Caution: you will have to make sure that your phone is unlocked, and will need a credit card to complete the payment. Also, not all countries are eligible for international shipping, so please check beforehand! Currently, the United States, Canada, the UK, Ireland, and Australia are eligible, but double check just to make sure. If your country is not eligible for international shipping, you will need to provide an address in Japan for the company to send you the SIM card, or you’ll have to pick it up at the airport. Plans tend to range between 1,000 to 4,500 yen a month. If you are a Go! Go! Nihon student, contact us to get more details, along with some benefits! SoftBank is the most foreign-friendly provider in Japan; it is also the only provider that offers pre-paid mobile phones. The only thing you need to bring with you is a passport. To get a pre-paid phone, simply walk into any official Softbank store (not a kiosk in a mall or electronics store) and tell the staff what you’re looking for; even if you don’t speak Japanese, almost all Softbank stores have at least one English-speaking staff member. Prepaid-phones cost anywhere from 4,000 – 7,000 yen (about $40 – $70), though prices vary depending on models and service options. It is free to receive calls and unlimited text messaging can be added on for a small fee, though making calls to non-Softbank phones can be expensive. You can add minutes to your phone via the SoftBank website, bank transfer, or prepaid-phone cards which can be found at most convenience stores. For students with an unlocked smart phone, this is the most convenient option to use your cell phone in Japan. B-Mobile offers pre-paid SIM cards that run on the Docomo network, so be sure to check that your phone supports the appropriate GSM frequencies before purchasing a SIM card. Keep in mind that these SIM cards are data only, which means you won’t be able to make or receive regular phone calls. Find out more about pricing, delivery, and service options on the B-mobile website. Don’t want to bother with ordering and setting up a SIM card which may or may not work with the phone you have? Another potential solution if all you need is data, is to get a pocket wifi and just carry it around throughout your day. Ninja Wifi is a company that provides this service, letting you connect up to 10 devices at a time, with plans varying between 3,000 and 6,000 yen per month, depending on how much data you sign up for. Go! Go! Nihon is partnered with them, and therefore all students applying through us get benefits such as discounts on activation and insurance. For more information about Ninja Wifi, please contact us here! Rental phones are another affordable option for short-term visitors not planning on staying more than a month in Japan. The only requirements for renting a phone are a picture ID and a credit card, and fees are typically 200 – 500 yen ($2 – $5) per day for regular phones and 1,000 – 2,000 ($10 – $20) yen per day for smart phones. While this is a bit steep, there are special deals and discounts for anyone who pre-orders a rental phone before arriving in Japan. Finally, you might be tempted to skip all this and just bring your current cell phone to Japan and use a roaming plan from the service provider in your country. Do not do this unless your parents are millionaires and you are coming to Japan on a private jet. If you have an unlocked phone from your home country that happens to run on the same GSM frequencies Japan uses, you might be able to purchase just the SIM card from Docomo or Softbank. 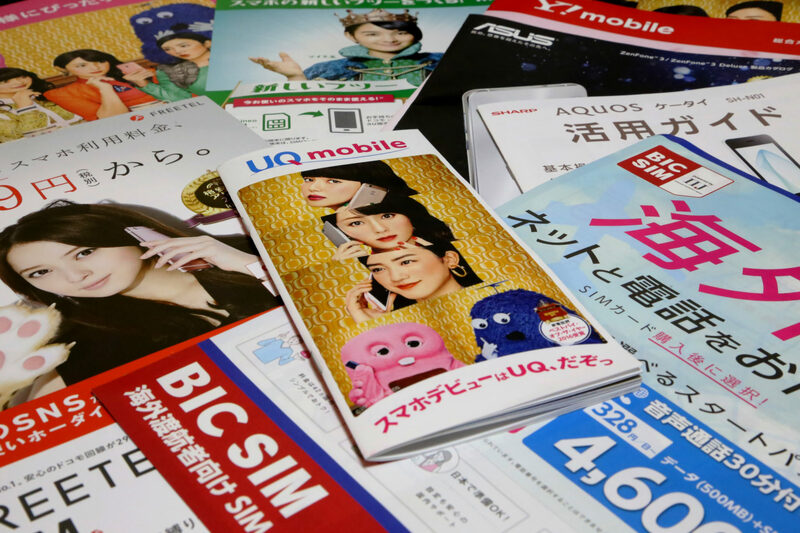 There are also a number of independent SIM card providers offering both data and voice plans; though it may take a bit of research and hunting around, these can be the most practical and affordable option for anyone with an unlocked cell phone in Japan. Phones have become an essential part of everyone’s routine: whether it’s texting, researching or finding an itinerary, we have all come to depend on them in various ways. Whichever option you pick, access to a phone while in Japan will surely help you make the most of your time here. For information about living and studying in Japan, or how to get a student visa contact us. We’ll get back to you in a few days!